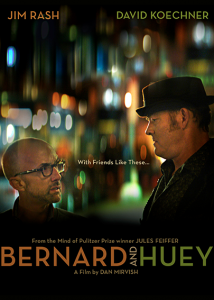 Based on characters that originally appeared in Oscar/Pulitzer-winner Jules Feiffer's Village Voice comic strip dating back to 1957, Jules wrote the screenplay to "Bernard and Huey" in 1986. It took director Dan Mirvish (Slamdance co-founder) four years to track down the script and work with Feiffer - now 88 and still extremely active as a graphic novelist and playwright - to reinvigorate the project. Cast includes Oscar-winner Jim Rash, David Koechner, Richard Kind, Nancy Travis, Sasha Alexander, Bellamy Young and Mae Whitman, among others. Shot on Super16 film and Alexa. The film starts with post-collegiate Huey (a roguish ladies man) and Bernard (his nebbishy best friend). We flash forward 25 years and now Bernard is a successful New York bachelor, and Huey arrives on his doorstep looking old and washed up. As the two reconnect, Bernard starts a relationship with Huey's estranged daughter Zelda, an aspiring cartoonist. Huey slowly gets his mojo back and tries to seduce various women in Bernard's life, including on-again-off-again girlfriend Roz and workmate Mona. Zelda treats Bernard like Huey treats women, and Huey and Bernard fall back to their old ways as the ladies' man and the nebbish. But along the way, Huey reunites with his ex-wife, Aggie, his brother Marty and reconnects with Zelda. Bernard finally realizes that he may indeed wind up with a woman old enough to be his wife.